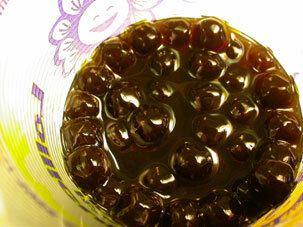 In case you don’t know what boba (or ‘bubble tea’ for the round eyes) is, it’s a tea or fruit drink with tapioca balls in it. It’s super num! The other Day I was talking on the phone and my girlfriend mouthed the words “do you want? ...” and then made this ‘sucking gesture’ and bobbed her head up and down. I hurriedly hung up the phone and was all exited, then I found out she meant ‘Do you want to get some Boba?’ I wasn’t even mad! We were going to go get Boba! How can you not like boba? It’s a drink with Puddin’ in it!